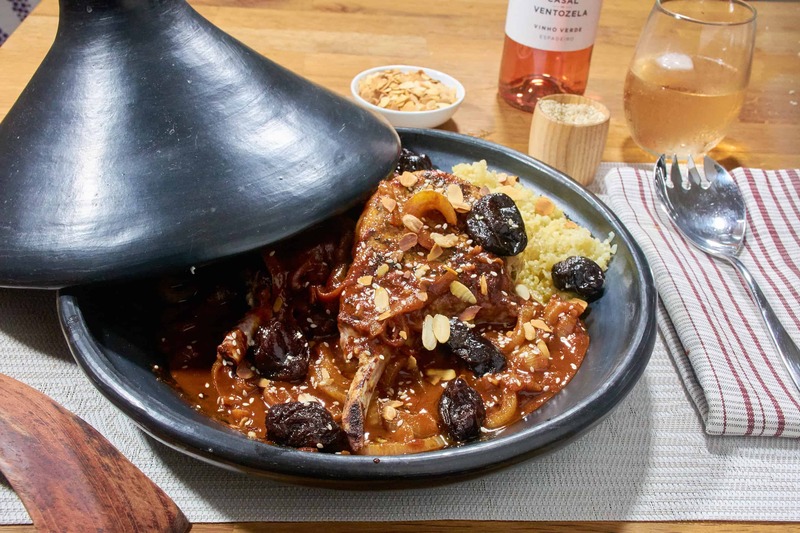 I love the complex flavors of tajines, with their sweet highs and nuanced undertones from the spices. One of the best I've made at home is from the Moroccan Modern cookbook, and I've come up with my own version that uses sous vide to perfectly cook the meat. I like to serve this dish over some grains like farro and quinoa, or some cauliflower rice. The honey in this recipe isn't marked as optional but if you really are trying to reduce your sugar intake you can use less or leave it out, but the flavor balance will be affected. If you would like more information about the modernist techniques, ingredients, and equipment used in the sous vide moroccan-style tajine with pork chops recipe you can check out the following. Mix together the spices in a bowl. Lightly salt and pepper the pork chops then sprinkle with the spices. Place in a sous vide bag then seal the bag and cook for 2 to 3 hours, until heated through or pasteurized. Heat some oil in a pan over medium heat. Add the onions and cook until just starting to get tender. Add the orange juice, water, paprika, ginger, cinnamon, saffron, and bay leaves then bring to a simmer. Let simmer for 10 to 15 minutes until thickened. Remove from the heat and stir in the honey and prunes. Salt and pepper to taste. Take the pork chops out of the water bath and remove them from the bag. Dry them thoroughly using paper towels or a dish cloth. Quickly sear the pork chops for 1 to 2 minutes per side, until just browned, then remove from the heat. Place the cooked grains or cauliflower rice in a bowl or on a deep plate. Top with a pork chops and then spoon some of the tajine over the top. Sprinkle with the toasted almond slivers and sesame seeds then serve.